Scale Weighing Systems, SWS-7620DFS-LED Series industrial floor scales are rugged mild steel floor scales, ideal for general purpose weighing applications. With a platform height of only three inches, these floor scales allow easy access to and maneuvering of all types of load handling. 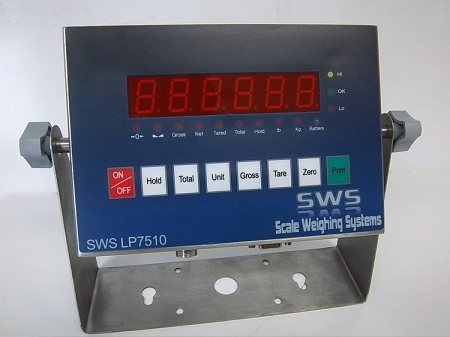 The SWS Series digital electronic floor scales weigh in either pounds (lbs) or kilograms (kg) weigh modes plus additional functions include Hold(for Animal Weighing) , Check-Weighing and Totalization. 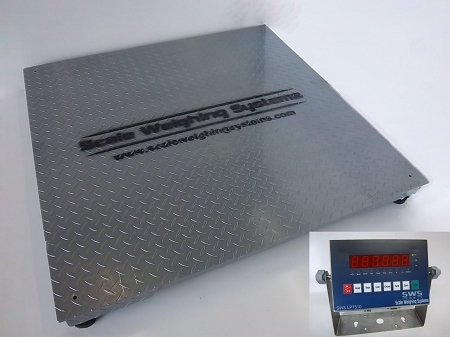 The SWS-7620DFS-LED Line of low profile floor scales are fully electronic and were designed to give accurate and repeatable results with every weighing. The SWS-7620DFS is available in a 3' x 3', 4'x 4', 4' x 6', 5' x 5' and a 5' x 7' Platform size and several capacity configurations. Heavy Duty Ball-Capture Feet are included and allow for setup on uneven surfaces. The SWS-7620DFS-LED Industrial Floor Scale Indicator is completely Stainless Steel ( NOT PAINTED STEEL, NOT PLASTIC). Connected to the platform with a 20` Steel Braided Cable allows the Display to be positioned away from the base without the worry of those pesky rodents chewing the cable. The SWS-7620DFS-LED Series Floor Scales are AC/DC, and the built in rechargeable battery last ( Aprox. 100 hrs ). The bright red 1" high LED makes the display visable from across the warehouse. The MS Series also features an easy to use Over / Under indication with rugged construction. The Scale Weighing Systems Series Floor Scale is your ideal, economical weighing solution for applications such as Portion Control, Straight Weighing or Over / Under weighing. The SWS-7622DFS Display Indicator can be Wall-Mounted or set on the Desk-Top with the included bracket. An optional telescoping display stand ( pictured above ) is available and is adjustable from 39" - 60 " high.